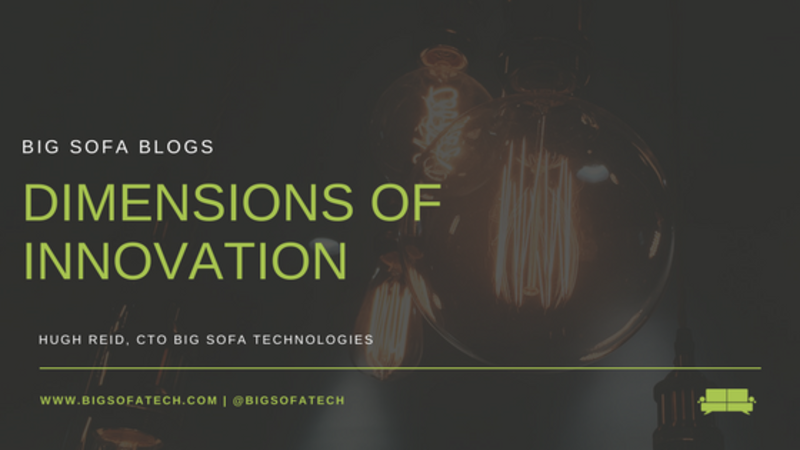 November 2017, Hugh Reid, CTO Big Sofa Technologies Ltd.
At BST we claim to be innovative and disruptive, but what does that actually mean in reality? Many businesses aim to be leaders in their field, but what does it take to incorporate real innovation and become disruptive? In an operational context, BST provides both video technology solutions and Consumer Insight services to predominantly the consumer goods industry. In this broad sense we are a technology first company with a heavy dogfooding culture, but one where our services team also provide a healthy revenue stream and a lightning fast feedback loop. Both parts of the business innovate. To be the best in the field you need to be the most advanced in the current methodologies and adopted technology in the market; but to be innovative you need to be looking beyond the currently adopted technology towards the next opportunity for a step change in the market offering; and to be truly disruptive you need to be taking development risks that change the shape of the future of the market sector you operate in. Innovation takes time to diffuse into the market. It has taken the last 7 years for video based market research to go from being barely understood to a methodology that is undergoing industry wide adoption. Many technology providers have come and gone in those years, some have been undoubtedly ahead of their time while others were not quite what the industry needed; BST are still here because we have focused heavily on providing a video technology platform that can be used to deliver good quality insights at every stage of that evolution of adoption. Twenty five years ago someone noticed that technological innovation tends to follow a Sigmoid function, or S-curve, for discrete components of computer systems. On average, over a long time period, this leads to a continuous improvement in the overall system as each component follows its own S-curve progression at a difference cadence. In the digital space the [overused] example is the switch from film cameras to digital cameras in the early 2000s that was fueled by each of the camera components going through its own S-curve (digital lense technology, digital storage capacity, internet connectivity) and led to a step change in technology that caught Kodak by surprise. Each of the components used in video analytics are themselves subject to their underlying technology curves; so while digital camera technology may have reached a plateau, the capability of the devices and the connectivity is going through its own “uptick” in development (a camera in every phone, 4G connectivity). IoT, A.I. and Big Data are having a similar impact on the data processing components. There are many use cases that can be addressed with this stack of component technologies, and BST is currently focused on the core Consumer Insight applications. BST is investing a significant proportion of its resources in exploring the potential of the technological advances in these component technologies. So how can we harness these advances in technology for the benefit of our products and our clients products? The core of the answer to that question is “timing”. So in the same way as OK Go need vision and timing to switch treadmills, a technology based company needs to know when (and when not) to switch the component curve and jump into a technology as it emerges. For BST and the Market Research industry, general accuracy and the reliability of the data being generated by video is very important. And it doesn’t matter if this data is coming from automation or via a human being, any backward step in quality will have a disadvantageous effect on the quality of the output. As a result we monitor the technology areas that underpin our platform and processes looking at adoption rates among complementary industries. We also periodically test technology for its maturity, looking at several factors of usability and convergence of surrounding methodologies. But at the end of the day it is the technology and services teams that will deliver product improvements based on these advances, and so we invest in training and experimentation (see our recent Hack Day series) as a way for them to achieve mastery of the skills and tools for next year’s version of the platform. To provoke and promote step change in our platform BST has established a technology research team whose role it is, not to innovate on their own, but more to try and get the timing right. The core innovation still comes from the whole of the company working together to reinvent video based Consumer Insight, and the spontaneous nature of ideas in this area is hard to plan around. Innovation needs to vest into the platform at the time when it is ready for adoption; not too early, never too late on the S-curve; and it is the responsibility of the research team to guide the product managers in this area. The secondary role of this team is to communicate the knowledge around these innovations to the client base and gently warm them up to the crux of the innovation impact. So how can a series of innovations become disruptive? Single innovation steps are not generally disruptive; users of the innovation can revert back to their old ways or just take a really long time to adopt the new innovation. Multiple innovation steps in the same direction suffer from the same lack of adoption stickiness. But when multiple innovations happen in more orthogonal directions then it creates a more permanent pressure for change. Combinations of innovative steps have the capability of becoming compelling and therefore disruptive by affecting more dimensions of user behaviour. To illustrate this with another [overused] example, that of Self Driving Cars, there is no compelling reason to have a car that drives itself at the moment [mid-2017]; the cost and risk factors will slow adoption rates. Similarly there is no compelling reason to have an all Electric Car either; practical charging issues and unproven battery life being among the concerns. But have you noticed that most Self Driving Cars are also Electric Cars? That is because the economics of a car that combines the benefits of no human driver to pay and a low-maintenance vehicle lifespan makes it viable to replace all the cars that people own with an automated on-demand taxi service. Neither innovation is in itself disruptive, but with these 2 dimensions combined, they will eventually change the whole personal transport industry. BST employs this dimensionality of innovation to cement our vision of video as data with our clients. When we advance our platform in terms of providing a better technological solution for our clients, then our services team build on that advance by pushing the boundaries of Consumer Insight methodology in that area, so that the combination of the 2 steps is as sticky and disruptive as possible. These methodology changes can be subtle, like a change in the sequence of events or the roles and responsibilities of the team, but they unlock the value of the technical innovation in the process. True disruption doesn’t happen overnight and it takes our services team a long time to promote a new methodology or innovation amongst the industry early adopters. BST makes a concerted effort to work in collaboration with the industry thought leaders, and by speaking at conferences and piloting new ideas with clients we aim to establish the social framework for the consensus driven adoption of new disruptive practices. And we are lucky enough to have some really enthusiastic clients! Taking home grown innovation and applying it to an evolving market context requires careful adoption and attention to timing and market readiness. BST does this by leveraging the service team’s close relationship with our clients (both large and small) to combine technological advances with methodological advances to promote disruptive change. The two dimensions of innovation leads to a more compelling solution and platform for video based insight.